Another regional gem – this one in Inverleigh, about a half hour drive from Geelong. It’s on the main street, a small unassuming Victorian weatherboard. This lunch time I was dining on my own. There’s a choice of a five or eight course tasting menu. As I had a dinner booking back in Melbourne at 6pm, the five course was really the only option if I wanted to have any chance of being even slightly hungry by then. Not being a dessert fan, I asked in hope if I could swap the dessert course for another savoury. I expected the answer to be no, so I was really happy that it was no problem at all for them! I was even asked if I wanted anything in particular but I chose to leave it up to the chef, Matt Dempsey. Matt is committed to sourcing local produce, and I was pretty certain I’d be happy with anything that came from his kitchen. Not only could I not eat too much, I was also driving so I couldn’t have the matched wines, meaning I was restricted to just two glasses (damn it!). To start, I chose an Austins chardonnay from Geelong. Geelong certainly knows how to do a good chardonnay, and I have always liked chardonnay, even when it was out of fashion. The waitress was just lovely and was very pleasant, engaging just enough with me. It wasn’t long before a small starter was brought out – Braised octopus with hummus and Dukka with a watermelon and grape granita – a nice thing to kick off with. Then came the Pan fried Parisienne gnocchi with asparagus and goats curd. I really liked this. The gnocchi was beautifully golden and the dish was so well presented. This was followed by my additional savoury dish – Cured ocean trout with creme fraiche, melon and sea succulents. Thankfully a nice light dish and it looked amazing – I do love ocean trout. Then, the Barbecued Queensland prawn, soy cloud, puffed rice and avocado. Big chunks of firm, meaty prawn! The prawn was perfectly cooked and it was so good that I was willing to forgive the fact that there was quite a bit of puffed rice on the plate – I have to say, I’m a bit over the whole puffed rice thing these days. Time for my second glass of wine. I decided to switch to red and ordered a glass of Henschke Henry’s Seven. I’ve always been a fan of it. It arrived just in time for next course which was Western plains pork belly with grilled pickled onions, brussel sprouts, cabbage purée and mustard dressing. This was really enjoyable, and once again, looked great. And then, for the final dish – Lamb belly and rib with eggplant purée, goats curd – nice, but the rib was a bit too fatty. What I was surprised about was how quiet the place was for a Sunday lunch. Apart from me there was only one table of two and a table of four. 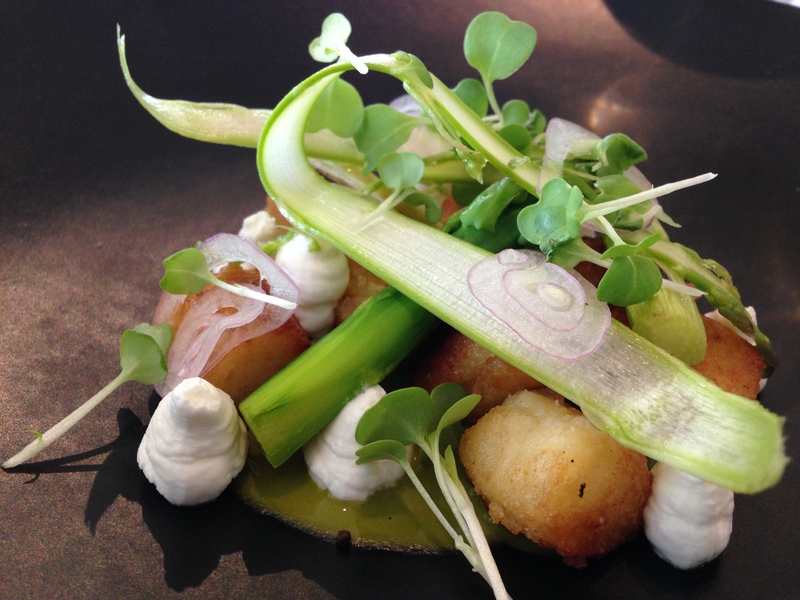 I’d certainly recommend Gladioli – the food is of a high standard, as is the service. Make a weekend of it and do Brae as well. The presentation of all of these dishes is beautiful! I finally got to read your review Jacqui! I try not to read up too much on the restaurants I’m planning to go to at some stage so it is good to see what you thought of Gladioli. I am guessing they have just a couple of bumper nights a week due to the prices, but I agree that it’s worth it (and that it is a bit surprising if they are not getting good numbers). It sounds like you were impressed, but maybe not as inspired as some of the other top 100? I had an awesome meal and loved the wine matching. I am staggered by the restaurants around here with Brae, Gladioli and now Igni all within an hour of each other – pretty amazing!